On a day of shopping in Harajuku all you wish for is more money and a place to rest your sore feet. Now my friend Annabelle and I were looking for such a place to rest and have some food and found Dream Station, which is located at the end of Takeshita Doori. Inside are several places from the famous Crepe shops to Kebab stalls, and the newly opened MOEKAWA ♥ CAFE. Moe + Kawai = Moekawa! On that theme, the waitresses from Moekawa Cafe were dressed up in cute, maid-inspired outfits, even though they are not strictly speaking a maid cafe. The staff was very cute, apparently some of them are idols, and they were really friendly. They even let us take a picture with them. Moekawa Cafe specialises in little snacks and drinks. As said, they are not a Maid cafe, so they won't put a "moe moe kyun" spell on your food or dance and sing, but the food definitely shows the cute touch that you'd expect from the name: tiny eggs with mouth and faces on them, heart shaped carrots, potato stars and a ketchup heart are some of the decorations used. My egg yakisoba was layered in a cup to give it a cute yet colourful pattern. I also got an Acerola drink for free as special opening offer. The staff is extremely friendly and open, they don't expect money for taking pictures and allowed me to share it online - that's a rare luxury in Japan! I was really happy about that and asked if I can take a video next time I visit them and I got a positive response. Lucky! The Moekawa Cafe has already been to Paris before, and functions as a flexible entertainment cafe, meaning they are at Dream Station for a limited time. ☆The staff is cute, friendly and moe = Moekawa! ☆The food is decorated with love and moekawa power. ☆The prices are reasonable (my yakisoba was 400yen) and the portions are perfect. ★No moemoe performance shows, but apparently they might be using the JOL stage for　performances, according to their web page. I LOVED Moekawa Cafe, especially because of the staff. They were so kind, cute, friendly and moe, how can you not like them?! No matter how difficult a customer I was, they really took in my requests (especially when I went there filming another day) and remained sweet and charming. Perfect service! I find Moekawa Cafe is the nice alternative to Maid cafes. You still have the cute girls and decorated foods, but you don't have table charges, photo charges and high prices. It's like a maid cafe accessable for girls, in a nice and girly atmosphere, with the staff being like the nice "oneesama" (older sister) type that really cares. ☆ATTENTION!☆ The Moekawa cafe is running from October 2013 till the 31st of January 2014! If you want to get a chance to go to see them you have to hurry! 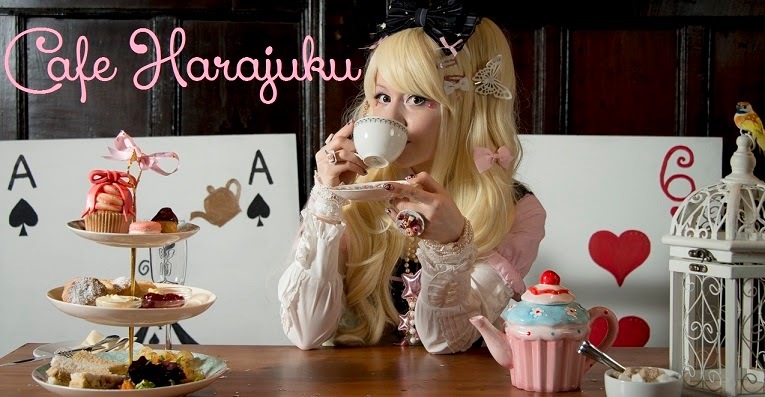 Perfect time out for your Harajuku Shopping trip! I will definitely, definitely go there again if I get the chance. I hope they continue doing the cafe in other places in Tokyo, or extend their time in Harajuku.